City in the Austrian province of Moravia. 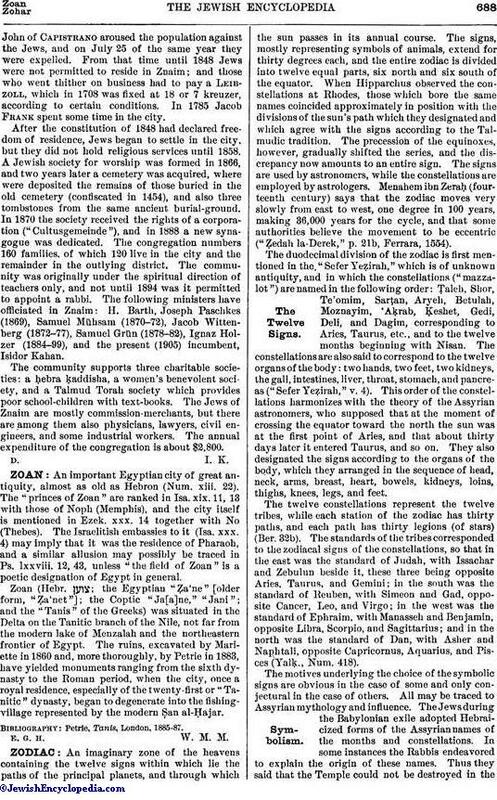 Jews probably settled there during the twelfth century; for in a document of Ottocar I. dated 1225 a Jews' street in Znaim is mentioned. During the Armleder Persecutions in 1338 and the Black Death in 1349 the Jews of this place were among the sufferers. Upon the complaint of the butchers in 1401, Margrave Prokop forbade the Jews to engage in the retailing of meat. King Sigismund, who was constantly in financial difficulties, borrowed from the city 905 florins, which the Jews in the royal cities of Moravia had to pay; of this sum the Jews of Znaim paid 400 florins, and those of Brünn only 300, proving that the former city had the larger Jewish population. The chief occupation of the Jews of Znaim in those early days was money-lending; in 1437 they were forbidden to charge a higher rate of interest than 3½ pfennigs per shock groschen, and in 1453 the rate was reduced to ½ pfennig. In 1454 the fanatic Franciscan monkJohn of Capistrano aroused the population against the Jews, and on July 25 of the same year they were expelled. 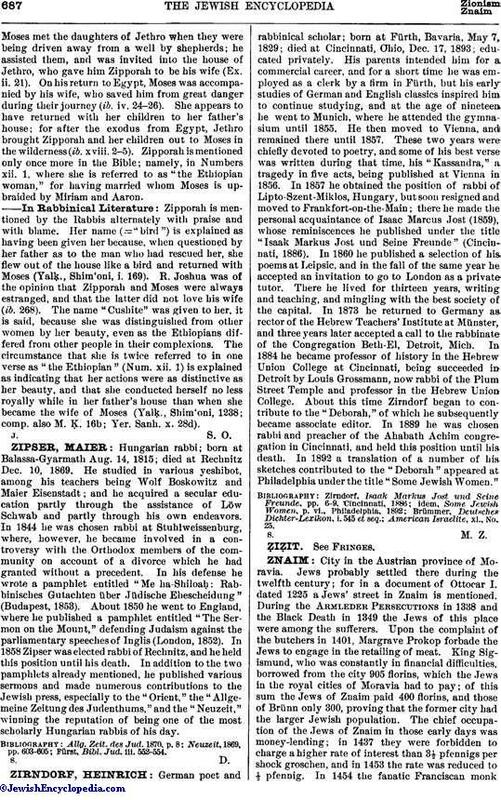 From that time until 1848 Jews were not permitted to reside in Znaim; and those who went thither on business had to pay a Leibzoll, which in 1708 was fixed at 18 or 7 kreuzer, according to certain conditions. In 1785 Jacob Frank spent some time in the city. After the constitution of 1848 had declared freedom of residence, Jews began to settle in the city, but they did not hold religious services until 1858. A Jewish society for worship was formed in 1866, and two years later a cemetery was acquired, where were deposited the remains of those buried in the old cemetery (confiscated in 1454), and also three tombstones from the same ancient burial-ground. In 1870 the society received the rights of a corporation ("Cultusgemeinde"), and in 1888 a new synagogue was dedicated. The congregation numbers 160 families, of which 120 live in the city and the remainder in the outlying district. The community was originally under the spiritual direction of teachers only, and not until 1894 was it permitted to appoint a rabbi. The following ministers have officiated in Znaim: H. Barth, Joseph Paschkes (1869), Samuel Mühsam (1870-72), Jacob Wittenberg (1872-77), Samuel Grün (1878-82), Ignaz Holzer (1884-99), and the present (1905) incumbent, Isidor Kahan. The community supports three charitable societies: a ḥebra ḳaddisha, a women's benevolent society, and a Talmud Torah society which provides poor school-children with text-books. The Jews of Znaim are mostly commission-merchants, but there are among them also physicians, lawyers, civil engineers, and some industrial workers. The annual expenditure of the congregation is about $2,800.